I know in some corners of the world, strawberries are still in season, but here in Virginia, local strawberries are pretty much a pleasant memory. Which is why I thought it was high time to grab the jars I tried pickling and pull them out for a tasting session this past week. 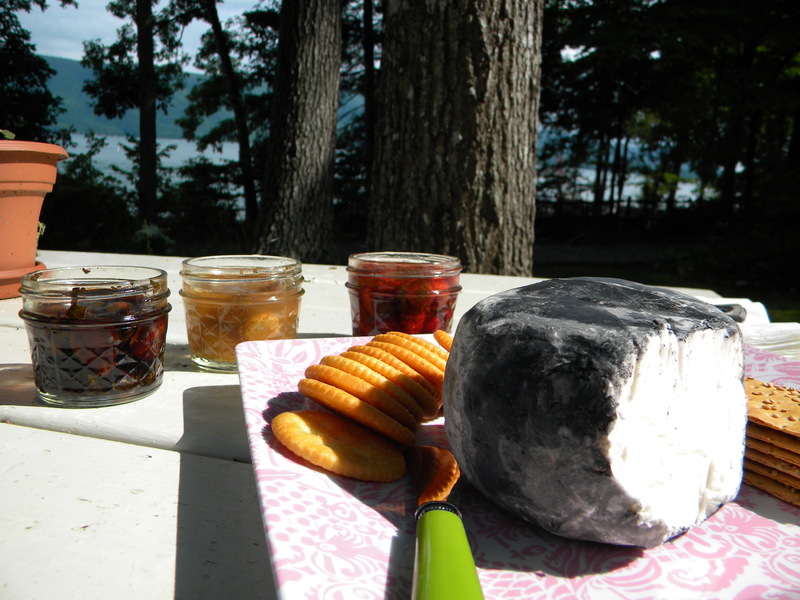 We were down at the lake with the Smiley’s and while the sun managed to shine for us to have an outdoor tasting session, it was mostly grey & chilly the entire time we were there. I’m not complaining though, because even on a grey day I’d much rather be at the lake than home. It somehow makes it okay to sit around doing nothing but catching up on reading. 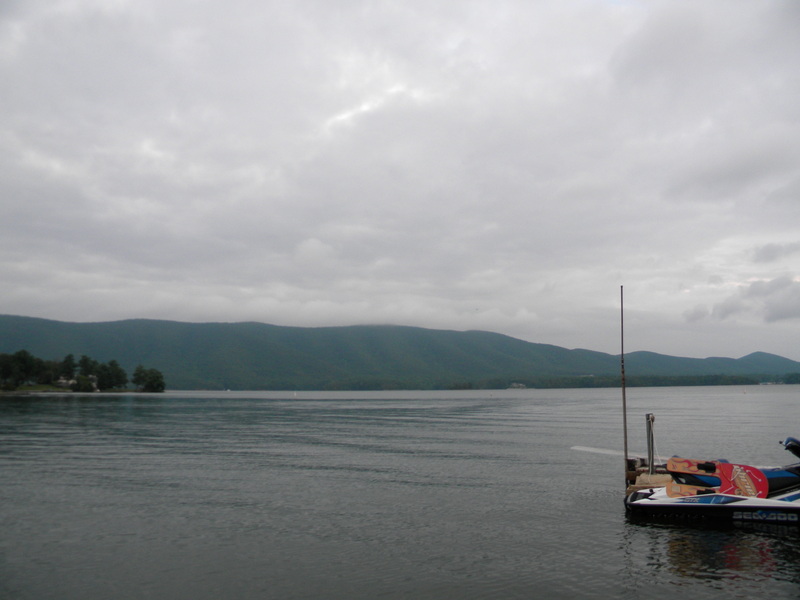 And you sort of have the entire lake to yourself when it’s cold & grey, making it far more fun to tube, even if you are wedged in that thing and as you are dragged back to the dock, you wonder how the heck you are going to get out of it. Still, it’s better than the old tube that you had to balance on top of that just getting on could have been a feat of strength in the summer games the girls came up with. Where was I? That’s right, pickles. Strawberry pickles. I was overdue to pull out the ones I’d put up last month and I knew Mollie would be up for a tasting session. 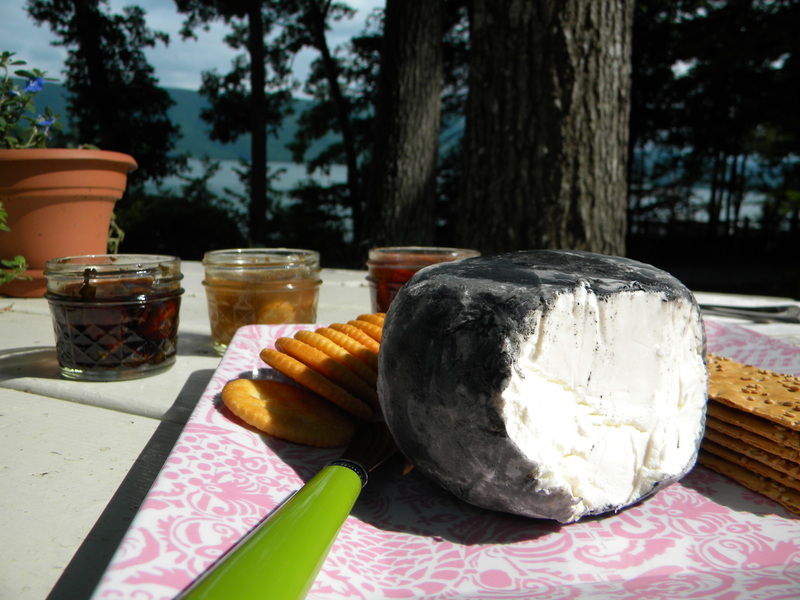 She even had a huge ball of lovely local-to-her goat cheese covered in grapevine ash that we served it with, as well as an assortment of crackers. This is why I adore going places with Mollie – together, we pack just the right things to pull together some fabulous meals. I go through a withdrawal period after our visits, because I quickly fall into the groove of having someone to bounce meal ideas around with. We improvise well together. So, the pickles. Earlier in the season, I had done some quick strawberry pickles as well as a small batch of hot water bath processed, to see how they would fare. 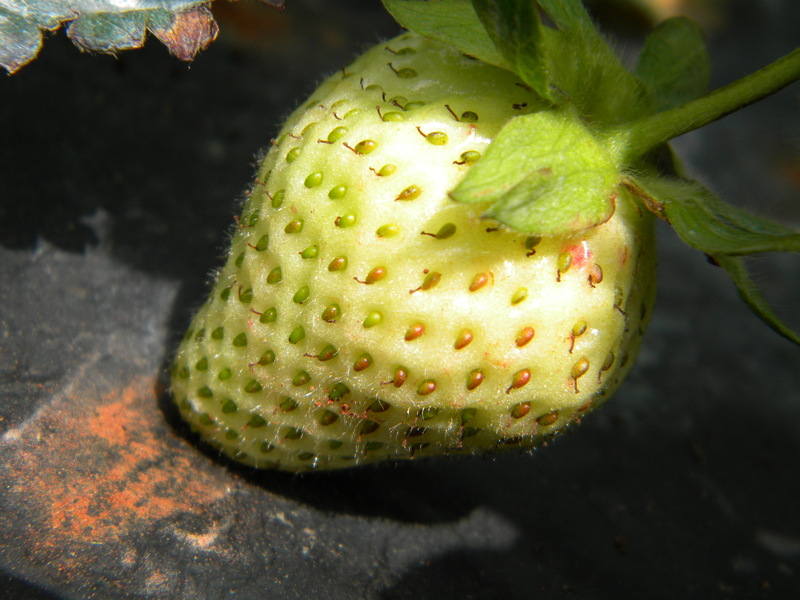 I was concerned about the ‘mush’ factor – strawberries don’t hold up to heat very well and since the canning process subjects the food to heat in order to kill the spores that could lead to food spoilage, well, it was inevitable there would be some mushiness involved. As I noted then, the mushy difference in the different pickling approaches between the berries was negligible. The berries I used this round were end of the season berries – I hit jam days over at Middle River Farms the first week in June- and while I was still able to pick some large luscious berries, I picked quite a few smaller, harder berries with the full intent of pickling them. If you’ve ever picked berries, you know what I’m talking about, those end of the season small berries. I cut the processing time down to 5 minutes from 10 minutes, after taking time to make sure the jars were sterile by boiling them for 10 minutes in an effort to reduce the mush factor. I did one batch of balsamic vinegar/basil/ripe strawberries, one batch of red wine vinegar/mint/hint of lavender/ripe berries and a batch of rice wine vinegar/ginger/lime/green strawberries. I had done the first two recipes the first time around, so this time I just tweaked them a bit – in the case of the balsamic, I used less vinegar, added water and it was divine. A sweeter version of Caprese salad in a jar if you will. With the red wine & mint recipe, I added just a few lavender springs, which weren’t noticeable, although I think they did help downplay the mint, which was not as heavy as with the first batch. Both pickles paired well with goat cheese and had a lovely, summery taste. Which brings us to the green berries. As much as I wanted to try this out earlier in the season, I just couldn’t bring myself to sacrificing future ripe berries. But come jam days and knowing that patch was only going to be open one day past the one I was there picking, I felt free to pick a few green ones and throw them in the mix for the sole purpose of pickling them. 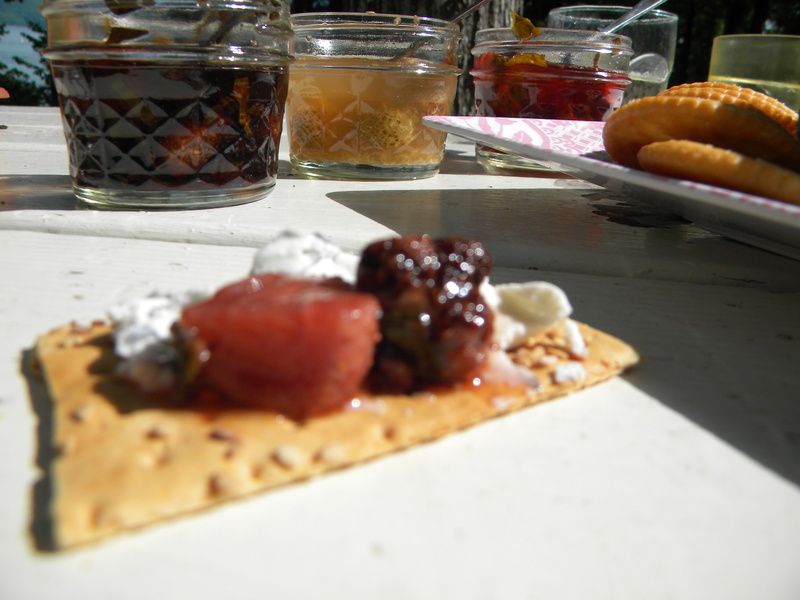 I had seen this recipe in my search for strawberry pickles and had been intrigued. I couldn’t get it out of my head and I wanted to try it. And try it I must. The pickled green ones did not get as mushy as their riper counterparts, although there was definite softening. Overall, this recipe was a disappointment. I followed it to the T – one part rice wine vinegar, one part sugar, half part water and a quarter part lime juice. Knowing that the acidity of fresh limes can differ, I used bottled lime juice – and the taste was so strong, all I could taste was bottled lime. It overpowered everything, including the generous dumping of fresh ginger I had used. Mollie did not think the lime was overpowering, reminding me that the green berries are naturally more tart to begin with. Next time I will cut the lime juice in half, while adding coriander. Sadly, because strawberry season here is done and gone, I have to drop this experiment until next spring, which seems like an eternity from now. In the meantime, I have a few jars that did turn out nicely, I can experiment with the rice wine vinegar & lime brine between now & then (surprisingly enough I have some other things I want to try my hand at pickling that are in need of a good brine) and next season I won’t hesitate to try my hand at green strawberry pickles. So, recipes. These are still in process, but if you want to experiment, here’s something to start you off. Bring to a simmer one part vinegar, one part water, half part sugar and pinch of salt. 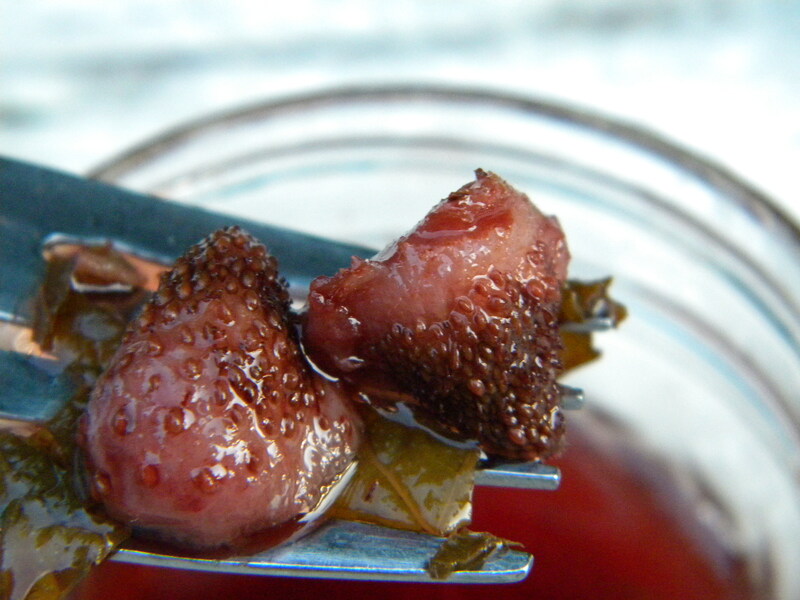 Pack into sterilized jars strawberries with a layer of finely minced fresh herbs. Cover strawberries with brine. Remove air bubbles, apply lids and process in hot water bath for 5 minutes. 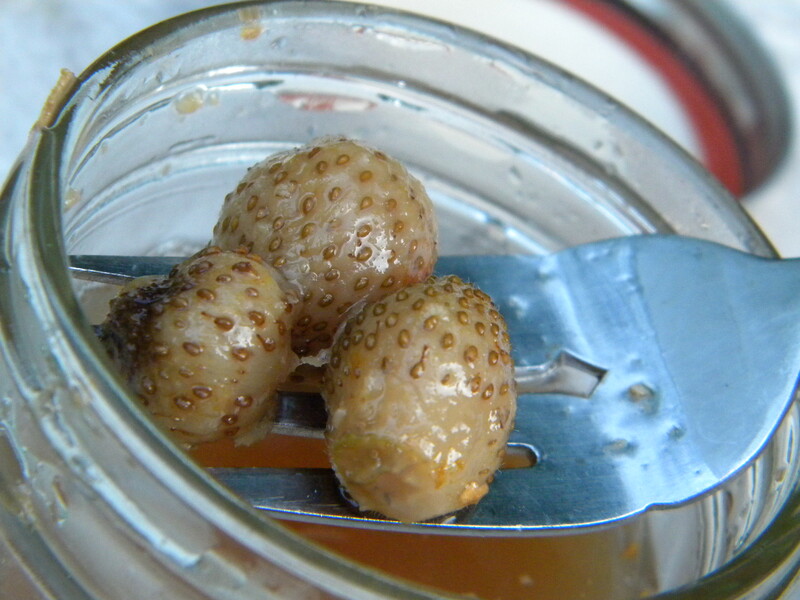 To be continued next spring…..
One day I shall try pickled strawberries! I shall bring them with me! 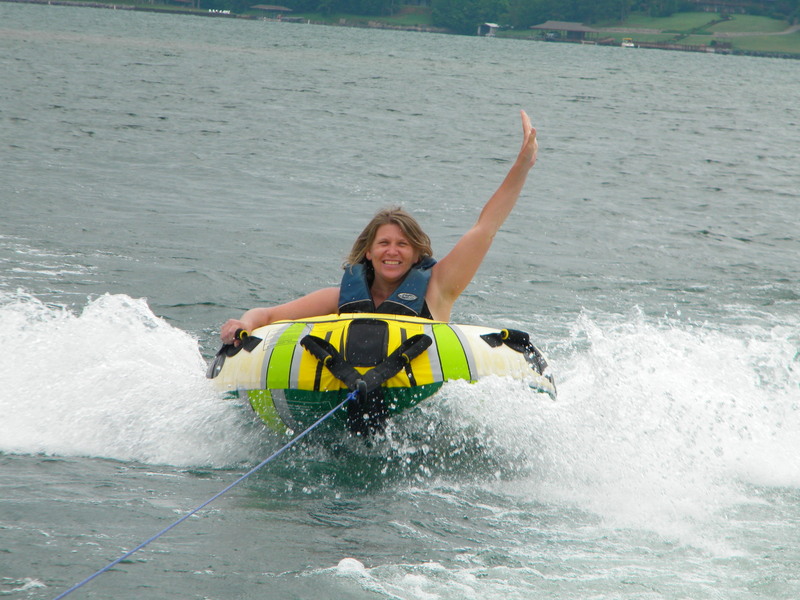 I love the tubing photo! Also, we have one lone strawberry growing like a pro in our backyard which is very late but I hope delicious nonetheless. How exciting! My strawberry plants are all kaput. You look AWESOME on that tube! Your comparison to Caprese salad has me intrigued… we’re all done with strawberries, too, but raspberries are upon us. Thanks, but I was IN it. AS in, wedged in it. I had to get to the dock to pull myself out, as I was not getting out any other way.